McKay: Even if I do get it working, there's still a thousand things that could go terribly, terribly wrong. Sheppard: I get it. It's difficult, million to one odds, blah, blah, blah. McKay: Was there something else you needed, or were you here merely to prod and belittle? Sheppard: No, no. Not merely. Following its third season, Stargate Atlantis lost its safety net and needed to prove itself to avoid facing the axe. Its forerunner Stargate SG-1 had been cancelled, which left fans wondering if the spin-off could survive alone. The producers shipped the beloved Samantha Carter (Amanda Tapping) to the Pegasus Galaxy, hoping to expand the show's fan base. They also aimed to develop lengthier story arcs and raise the stakes for each of the main characters. But would these moves be enough to save the franchise? After a strong opening run, the Sci-Fi Network made the announcement�Stargate Atlantis would return for a fifth season. Breathing a sight of relief, fans could now enjoy the series' finest season. From the outset, our heroes face a dire situation with little chance for survival. What's new, right? However, this pickle might be even too much for the ingenious crew to overcome. Adrift finds the expedition lost after turning the city into a spaceship to escape the tireless Replicators. Their power is dwindling, and it might take a desperate plan to avoid a final end. While Dr. McKay (David Hewlett) tries to think of any possible option, another team member is near death. Atlantis' leader, Elizabeth Weir (Torri Higginson), suffered a nasty injury before the escape, and her fate appears grim. This story moves at a breakneck pace and showcases the actors and crew at their best. The second part Lifeline is even stronger and includes a cast member�s departure in gripping fashion. This energetic two-part opening shows the writers taking more chances and enhancing the inter-personal conflict. All the characters' choices don�t work as planned and will have serious ramifications in the near future. The season's first half retains the early momentum and includes several standout episodes. Doppleganger begins with the typical encounter with a dangerous alien, but Writer/Director Robert C. Cooper brings a fun creativity to the dream-invading formula. The results stay within the series framework while honoring some sci-fi and literary classics. The highlight is Tabula Rasa�an intriguing one-off tale where nearly everyone gets amnesia. It might not sound promising, but some sharp editing and a clever structure make it work. Serving the larger story, the key episode is Missing, which reveals both the disappearance of Teyla's people and a stunning revelation that will drastically shape her future. It's not my favorite hour, but the importance to the ongoing story makes it a must-see. The first half concludes with This Mortal Coil, which feels a bit too much like SG-1's Tin Man but still plays a major role in the Replicator conflict. Before continuing, I'd like to comment on Amanda Tapping's development as Carter faces the new challenge of becoming a leader. During the final years of the long-running SG-1, I felt like she sometimes worked on autopilot, and Carter lost a bit of her personality. That trend continued during her first few Atlantis appearances, but I am happy to report that Tapping's work improves considerably by mid-season. Her acting feels more inspired and playful than it�s been in several years. The other regular newcomer is Firefly's Jewel Staite, who first appeared as Dr. Keller at the end of season three. It also takes her a little while to get moving, but Staite creates an engaging character. Her role doesn't make you forget about Dr. Beckett (Paul McGillion), but it helps to dull the pain a little. And don�t fret Beckett fans. I'll just say there's always a way in the Stargate universe. The mid-season cliffhanger sets up the season's best episode Be All My Sins Remembered, which delivers a monumental space battle involving our heroes, the Wraith and the Replicators. Following that high point, we're almost certain to see the expected lull, and it does occur. However, the downgrade is not as sharp as you might expect. Outcast gives some interesting perspective on John Sheppard's (Joe Flanigan) background, and Trio traps three characters in a room with little hope of escape. Yes, it's true that Harmony and Quarantine aren�t very good, but even those clunkers contain some amusing moments, particularly involving McKay's interaction with a young girl in the former tale. The final four entries build the momentum perfectly and lead into a truly surprising finale. Teal'c (Christopher Judge) even makes an appearance in Midway, which is always a welcome sight. The two-parter The Kindred sees the return of the ho-hum Michael, but he does raise the stakes considerably. Closing powerfully with the time-bending The Last Man, this exciting season has me primed for the new batch of stories appearing this summer. During each successive year, Stargate Atlantis has continued to carve its niche away from its predecessor and build its own mythology. The entire main cast is likable, particularly Joe Flanigan and David Hewlett, who consistently steal the show from their able counterparts. I've even grown fond of Jason Momoa's Ronon Dex, who seemed a bit too wooden at first. Weaving in recurring characters like David Nykl's sharp Zelenka and Robert Piccardo's controlling bureaucrat Woolsey, the creative team continues to build the excitement. They've definitely managed to escape the shadow of Stargate SG-1 and should continue to thrive in the upcoming years. Image Transfer Review: For a television show with a limited budget, Stargate Atlantis delivers consistently impressive visual effects. This is particularly true during the larger-scale episodes involving space battles and inventive new planets. The perfect example is the mid-season epic Be All My Sins Remember'd, which presents a massive space conflict effectively. The 1.78:1 anamorphic widescreen transfer remains consistent throughout the season and improves considerably over the broadcast version. There is some minor grain, but it's understandable when you consider the series' budget limitations. Audio Transfer Review: Viewing the behind-the-scenes featurettes, I'm repeatedly impressed by the ingenuity of the creative team to craft such a large-scale production from minimal sets. Much of this success is due to the believable audio, which enhances numerous sequences. This collection's 1.78:1 anamorphic widescreen transfer offers some powerful moments and cranks up the excitement. The sound could use a bit more sharpness and depth, but the overall quality remains strong throughout each episode. These featurettes cover a specific episode and focus largely on an interview with the director. In this entry, Robert C. Cooper gives an overview and discusses the fun of working with such a simple premise. He seems to truly enjoy talking about the craft and offers plenty of interesting story details. This segment covers the biggest change of the fourth season�the addition of Amanda Tapping's Samantha Carter to the main cast. She discusses the tough aspects of playing the leader role and shifting more into the background of the action. We also hear from producers like Joseph Mallozzi and Martin Gero about this decision. I would have liked to hear some reasons for eliminating Torri Higginson�s Elizabeth Weir, but the focus stays on Tapping's role. I have to start by questioning the inclusion of this extra on Disc 2. Dr. Beckett doesn�t return until much later! Viewers who hadn't watched the original television airing would have the surprise ruined. That said, this is one of the set's most entertaining features. It includes footage of Gero and David Hewlett chatting with devoted fans protesting outside the set. The banter is all in good fun and reveals the strong connection to the character. We also hear from Paul McGillion about the return and view some on-set footage. Gero and Mallozzi introduce the first appearance of the show's bloopers on a DVD release in tongue-in-cheek fashion. The material is standard fare, with bad line readings, laughing and bleeped-out words. It's no surprise that Hewlett is a frequent participant. Although this isn't groundbreaking material, I still enjoyed catching some lighter on-set moments. This is the only extra on Disc 3 and is easily the least exciting piece of its kind. William Waring spends way too much time on plot summary and provides basic information. Some stunt footage livens things up a bit, but it's mostly dull material. There is one silly gem�Hewlett singing while the actors chill during a break, but that's about it. I've always found Martin Wood�s comments to be insightful all the way back to the early SG-1 releases. This entry doesn't disappoint as he focuses on the emphasis on two people talking in this story. We also see some innovative techniques used for Sheppard's high climb and Zelenka's trip through the vents. Andy Mikita is another long-time series director and packs a ton of information into this 10-minute feature. The best moments involve the "free running" footage of the stunt guy playing the replicator and a crazy free fall from Bamford into the water. Mikita also discusses the appeal of delving into Sheppard's back story, which had barely been touched in the past. Finally, we have a slightly different type of feature. They still are looking at one episode, but move beyond the limits of the Mission Directive series. Gero discusses the evolution from a low-budget tale to a complex, expensive mess. The on-set footage reveals a crazy contraption that allows for the many inventive stunts. It really helps to have Gero involved, as his light-hearted, informative demeanor is engaging. His presence and the intriguing on-set material help to deliver one of the set's best installments. Past entries of this season summary were longer affairs that delved into the show's big decisions. That format continues here, but the result is much shorter and less satisfying. Gero, Mallozzi and others discuss the major goals, which included giving Teyla a story arc, getting rid of the Replicators (!) and going deeper into the characters. They also mention favorite moments, but even those are too brief. I'm hoping the next season's coverage will return to a larger-scale affair. Entering this final extra, I'd grown a bit frustrated with some lackadaisical features and hoped for something more than a few non-essential moments. I was relieved to see this lengthy, exciting collection of deleted scenes from five different episodes. The definite highlight is a conversation between Carter and Keller in Trio that reveals Sam's relationship with O'Neill. Where has this been for two years? It�s unfortunate that it couldn�t have appeared in the actual episode. Other fun moments involve a strange conversation where Caldwell appears to make a move on Carter and Ronon thinking a Battlestar Galactica episode on TV is actually happening. Gero and Mallozzi introduce each scene and give interesting reasons for each deletion. 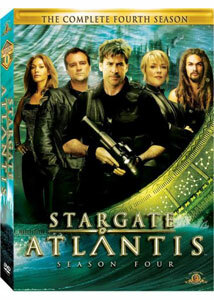 Stargate Atlantis's fifth season premiered on July 11th and seems ready to build on the success of the fourth offering. Showcasing a deft combination of silly moments and thrilling drama, the exciting series continues to shine. This excellent DVD release once again reveals the staying power of a goofy premise from a dated feature film. I expect that this impressive offering will push the new season into even stronger territory.